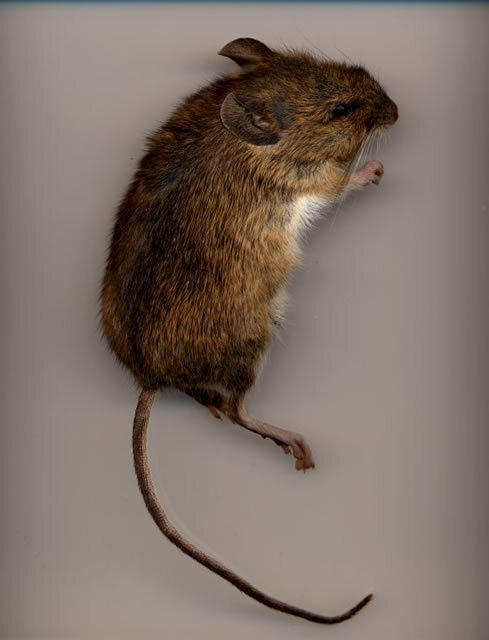 Dead mouse smell can be overpowering and the bodies attract flies and other insects. 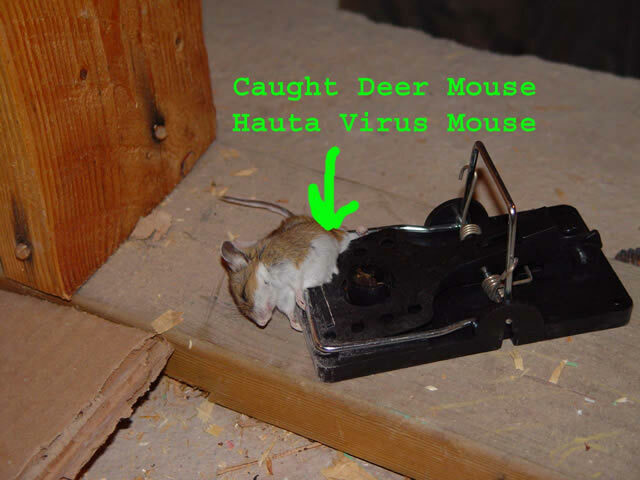 Deer mice are notorious carriers of Hauta Virus, a dangerous respiratory disease transmitted through airborne particles of mouse feces. DO NOT sweep up mouse droppings without protective equipment. Utility entry points are common access points for little creatures. They can climb rock, brick or pipes to enter a building. Mice live in attics because they are warm and have food and water nearby. They contaminate the insulation and often chew through electrical wiring. Mice in attics are a very common problem. Contact a professional mouse removal specialist in your area. 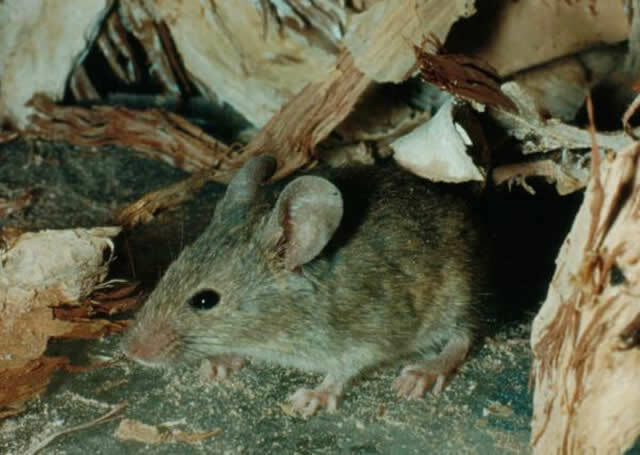 Mice are present in all parts of the United States; urban, rural, agricultural, commercial and industrial areas alike are home to these wee rodents. They don’t need much to get by, just a place with food and protective shelter from predators and cold. They do not even need much water as long as there is an adequate food supply. One pair of mice with adequate food supply can produce several litters within a few months, with 10-12 pinkies in each litter. By the time the pinkies are two months old they are sexually mature and ready to contribute to the population growth by having babies of their own. They reproduce so often and so numerously, it does not take long for a mouse infestation to grow quite large. How do I know if I have mice in my house? Droppings. Mouse droppings look like black grains of rice. Each one will leave this calling card 50 to 75 times each day. Gnaw marks and holes. You may find small holes in food packages that are made of cardboard or plastic. They will also chew up paper and cardboard to get material for their nests. 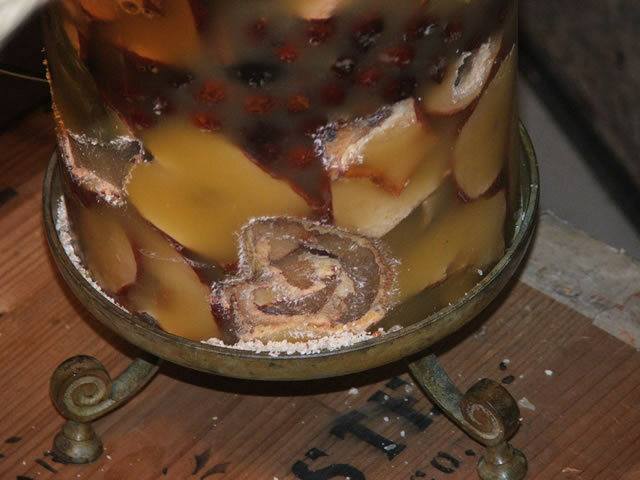 Beeswax candles are often found covered with bite marks and gnawed away. The scariest part is that they will chew through electrical wires, posing a fire hazard. Odor. Mouse urine leaves a musky smell. Sounds. People hear rustling, scratching, squeaking, and scampering sounds from above the ceiling and within walls. Usually there is more noise at night, when they are more active. Nests. You may find nests made of soft materials such as insulation, finely shredded paper, furniture stuffing, and other fibrous materials. The nests will be in sheltered locations such as in drawers, beneath appliances, inside furniture, in the attic, etc. To schedule an inspection, call Allstate Mouse Control: 1-888-488-7720. In cities, mice may live their entire lives indoors. In rural and suburban areas they may be found outside near foundation walls, shrubbery, weedy spots, debris, crawl spaces, burrows, basements, garages, or inside homes. They eat weeds, seeds, and insects, but when it gets cold this food supply is decreased so then they move inside homes, garages and attics to keep warm and to build their nests. 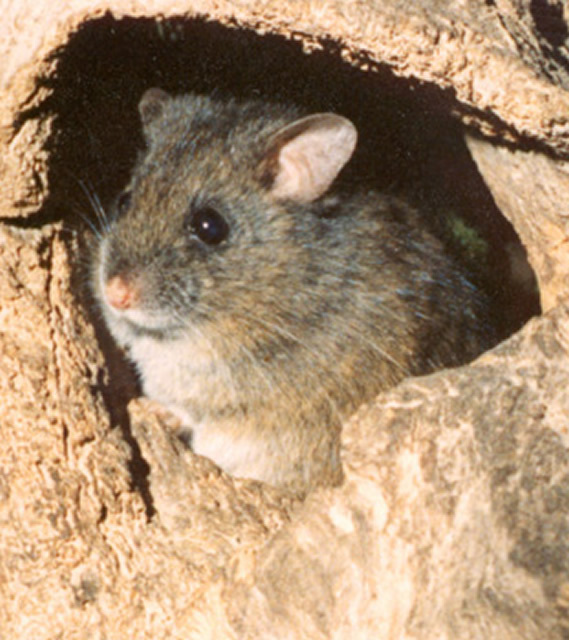 What is hantavirus? What other diseases do mice carry? Hantavirus is one of over 200 diseases that these animals carry. 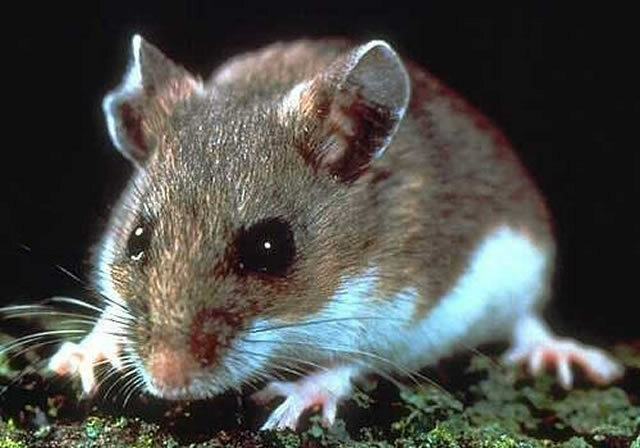 It has been found in the southwestern parts of the United States, and is carried by deer mice but not by house mice. Deer mice may be gray or reddish brown, with a white belly and a tail with white sides. Hantavirus cases usually occur in the spring and early summer because that is when many people clean out sheds, garages, and summer homes. When they find mouse droppings in these areas, they sweep them up which causes the hantavirus particles to become airborne. 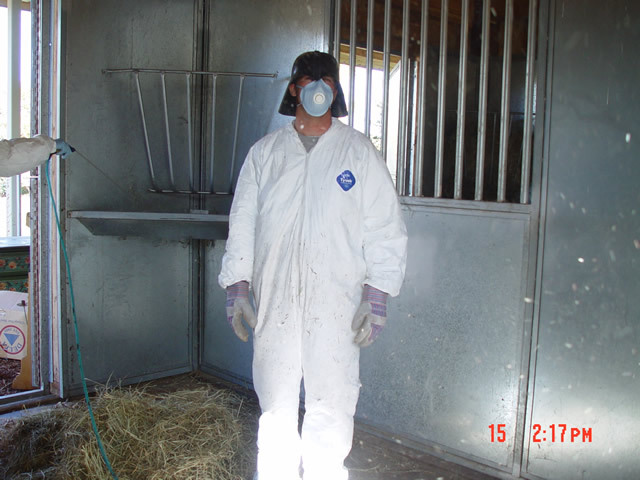 Then they are inhaled by people, causing respiratory illness which is sometimes fatal. This virus may also be passed through a bite, although that is rare. Salmonella is another disease commonly transmitted to humans by mice. It is transferred when people eat food that is contaminated by feces. This is why it is important for food processing plants take measures to get rid of and prevent rodents from contaminating their operations. You can avoid salmonella by throwing away any food products that may have had contact with mice, even if you don't see any droppings there. Consistently keep food in tight containers that are difficult to chew open, such as those made of glass, metal, or other resilient materials. Other diseases are carried by mice, even dead mice. Handling of dead animals should be done with caution, as a dead mouse carries as much or more disease as a live one. 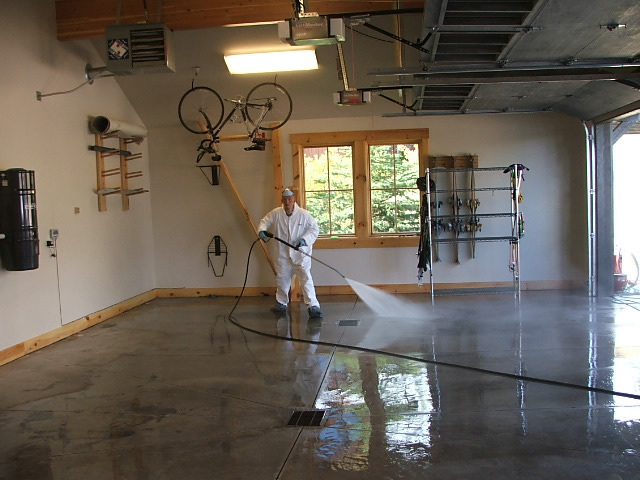 Decontamination services are available to sanitize and deodorize areas that have been occupied by rodents or other animals. 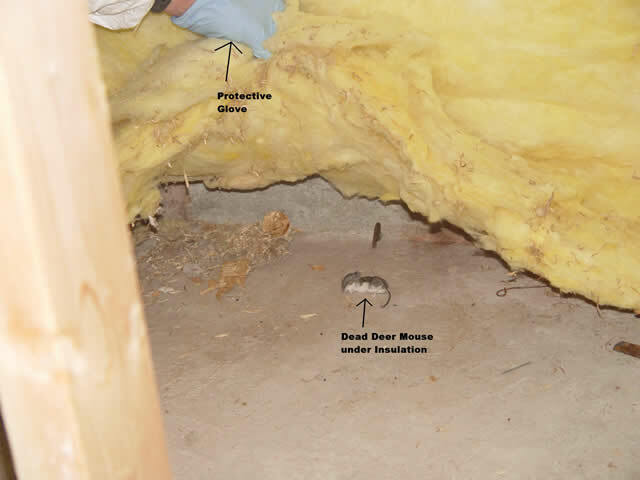 We remove contaminated insulation and can remove any lingering dead mouse smell. We also offer decontamination of areas that are suspected to contain hantavirus, using our specialty equipment and protective devices to protect our technicians from exposure. In addition to getting rid of them, it is necessary to take preventative steps to keep mice away. We offer exclusion services to deter mice and prevent them from accessing homes and other buildings; this is the most successful and longest-lasting method of mouse control. Using our exclusion method, also called block-out, we seal all cracks and openings that might admit animals into a structure. These may be found in foundations, at utility and water pipe entry locations, vents, and many other places. It is necessary that doors, windows, and window screens fit properly with no gaps. We often find mice in attics because they are good climbers, and can easily scurry up bricks, siding, stucco, or logs. They can also tunnel under concrete slabs and decks. They also will take advantage of holes left by woodpeckers or other animals, and are excellent jumpers. All these things must be considered in doing a thorough exclusion project. The bottom line is this: when a structure is improperly maintained, mouse removal is a short-term solution because more animals will inevitably come to take the place of the ones we remove. We do not recommend that property owners try to eliminate indoor mice through the use of mouse poisons. The reason for this is that while poison is very effective in killing mice, it does not control where they die. They could easily ingest the poison and then die inside a wall or underneath floorboards. The other part of this is that mice and rats will store poison, just as they store food. This means that even if you remove poison, more animals may come and find it wherever the mice stored it. You could end up with more dead animals long after the initial problem occurred. Poison may be a viable option for an outdoor problem, but it is usually a poor solution for getting rid of house mice. Our professional wildlife removal technicians can provide you with a long term solution of exclusion combined with extermination. We use mouse traps and mouse poisons to exterminate mice , depending on their location, their numbers, and other important considerations. We have the best mouse bait and know how to catch mice and rats and many other animals that may have invaded your property. Read more at our Mouse FAQ. For fastest animal control services, call us to schedule an inspection. You may send us 5-10 digital pictures of your pest mouse problem. Be sure to include all problem areas, surrounding areas, and pictures of anything else you think may be relevant. Using your pictures, we will give you a FREE telephone evaluation and a cost estimate of a complete animal control solution. Prices will vary depending on the severity of the problem and on the time spent on the job. Wild animals can be unpredictable. Every infestation is unique and our solution will be custom fit to your situation. Check with your insurance for coverage. We also offer expert coaching services for a fee, so you can do the job yourself. We can even ship the necessary traps and products to you. We accept Visa and Master Card. We also take purchase orders and cash. Deer mice have brown backs and white bellies. We trap all kinds of mice and solve the most difficult of mouse infestations. 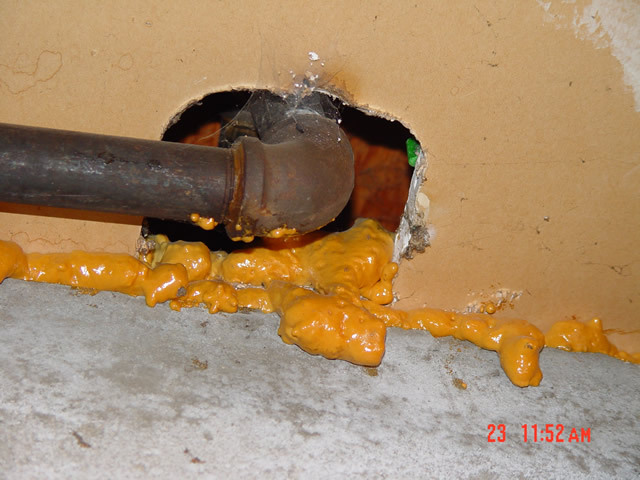 The pictured utility pipe hole is poorly filled with foam; our technicians filled the hole properly to keep mice out. We are professional wildlife removal specialists. We know how to get rid of mice. Mouse poison is appropriate when the population is quite large, and when the poison can be controlled so as to protect non-target animals. 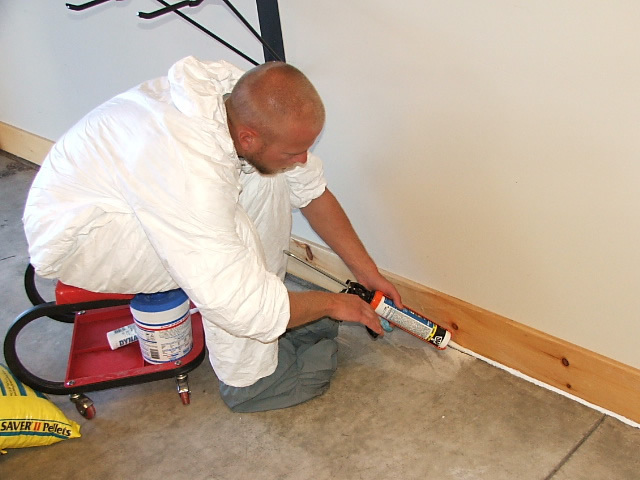 Modifications and home repairs are often necessary to keep mice away. 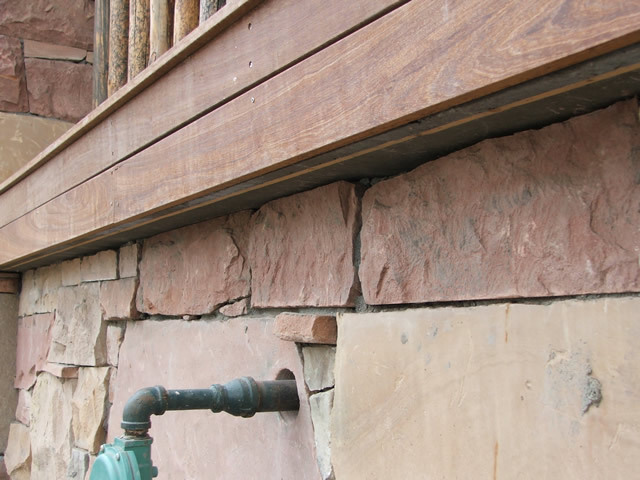 We offer complete mouse control, including sealing up all cracks, gaps and entrance points. We are mouse exterminators and we also provide detailed clean-up services. 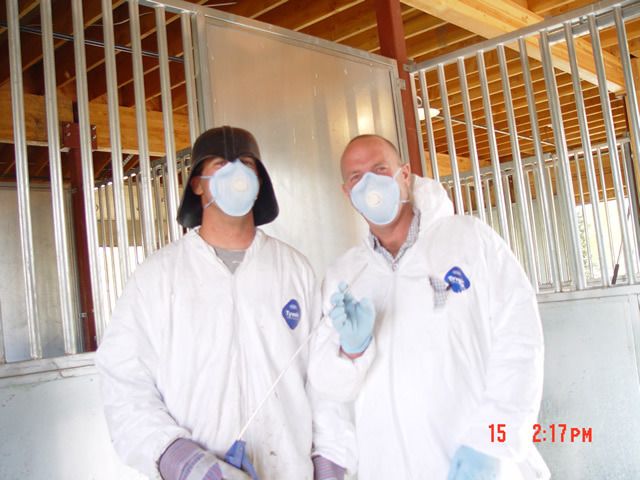 We scrub down Hauta Virus contaminated areas using specialty cleaners and protective clothing. Mouse extermination is just one part of the process. It is important to get rid of the diseases mice carry. 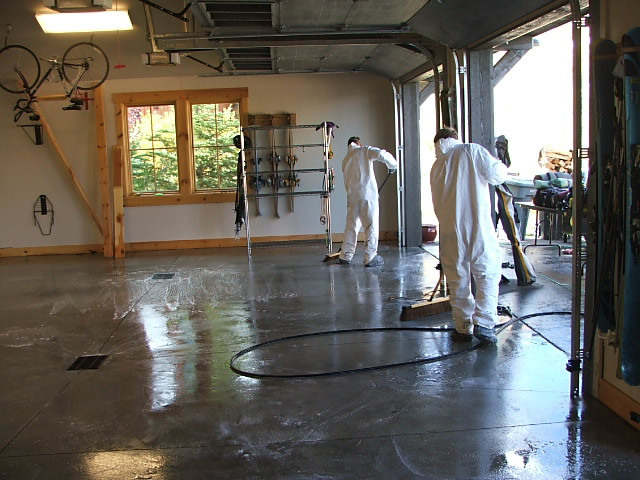 Here a technician is pressure washing a garage that was infested with deer mice. Our professional know how to catch mice and stop them from damaging your property. 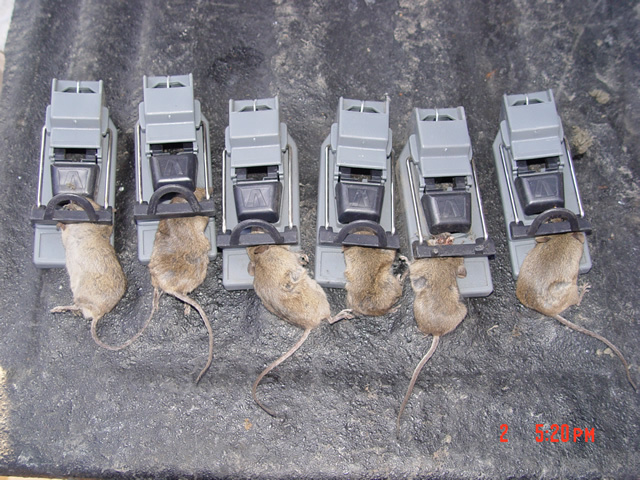 Six mouse traps filled with deer mice. These mice were living inside a house. These technicians just cleaned out a huge garage/barn that was contaminated by deer mice.